The many benefits of calcium for improving soil structure are generally well known in the turf industry. Many golf courses and sports fields already surface apply gypsum once or twice a year, usually via broadcast spreader in pellatized form. However, pelletized gypsum is expensive and requires a great deal of labor and equipment time to apply. Moreover, applying gypsum via surface application is really only an attempt to correct the symptoms of a problem, rather than the problem itself. Problems in soil structure, including poor infiltration and penetration, are typically due to sodium and bicarbonates in the irrigation water. Poor water creates poor soil! This is especially true with effluent water, which is by nature generally high in both sodium, (naturally and from home water softeners,) and also bicarbonates from the organic material in wastewater breaking down. Virtually every course already has an amendment program in place to deal with these elements. However, because soluble gypsum is logistically difficult to handle, water amendment is generally accomplished with the use of sulfuric acid or sulfur burners. With our program, Wastewater Solutions provides and installs its proprietary Aqua-Ject® injection equipment right at the wastewater treatment facility, with no need for any equipment or application to be performed on golf course property. The combination bulk silo and metered injection process is a stand alone, fully automated system with state-of-the-art controls that was designed to meet such a high level of performance and accuracy that it now has a patent. Golf courses are typically the largest users of reclaimed water, and yet they are also the most sensitive to water quality issues. The health and appearance of golf courses dramatically impact both their real and perceived value, as well as the quality of play and the overall golf experience. Water chemistry problems common to effluent water can impose limitations on the use of wastewater for irrigating golf courses, sports fields and other green areas because soil always takes on the characteristics of the water it is irrigated with. Amending the effluent with gypsum can optimize water quality, minimizing or eliminating its negative impacts on turf, plants and soil over time. 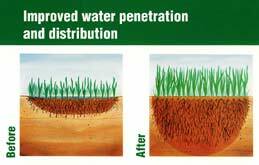 Simply put, better water creates better soil conditions, which ultimately improves overall growing conditions. By amending the effluent at a point nearest the source, all downstream users enjoy the benefit of improved water, and each one will also then enjoy the cost savings associated with a reduced treatment program. When considered together, these savings will often minimize, or even completely offset, the cost of implementing a single injection site upstream. The injection program is made even more attractive by our unique service approach where Wastewater Solutions provides all of the equipment and operates the system at our own expense, billing the municipality only for the gypsum as it is used, together with a monthly service fee. No capital equipment purchase is necessary! This is truly a win-win-win situation for the city, the golf courses/sports fields and the environment.